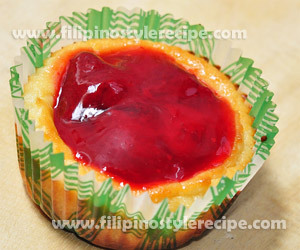 Filipino Style Recipe: Strawberry cheesecake is another variety of delicious dessert that can be served in all occasion. 1. To prepare the crust, combine the crushed grahams, butter, sugar and cinnamon. 2. Press onto the bottom of 9 inch ungreased springform pan. Refrigerate for 30 minutes. 1. In a mixing bowl, beat cream cheese using an electric mixer until light and fluffy. Gradually beat in the condensed milk. 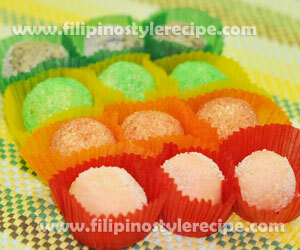 Mix in lemon juice, lemon zest, and vanilla extract. Beat in the eggs at low speed one at a time until just combined. Add the flour and beat again. 2. Pour half of the cream cheese mixture over the crust. 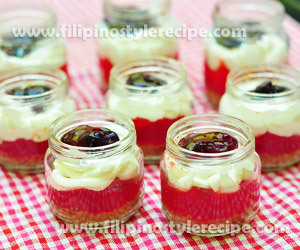 Place half of the strawberry fling by half teaspoonfuls over the cream cheese layer. Carefully pour remaining cream cheese mixture over the strawberry. 3. Based on the design that you want, drop teaspoonfuls of the remaining strawberry over the cream cheese layer.Cut through top layer with a knife to swirl and make the design. 1. Bake in preheated oven at 350 degrees for 45-50 minutes until center is almost set. 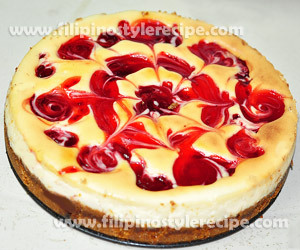 Turn off oven but leave the cheesecake inside for around 30 minutes. Remove from the over and carefully run a knife arond the edge of pan to loosen. Let it cool completely on wire rack. 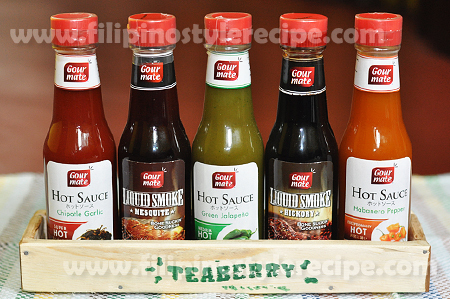 Refrigerate for at least 4 hours before serving. 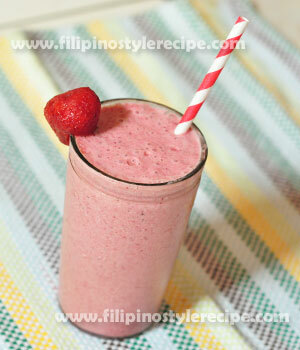 Filipino Style Recipe: Strawberry milkshake is one of the popular refreshing beverage. 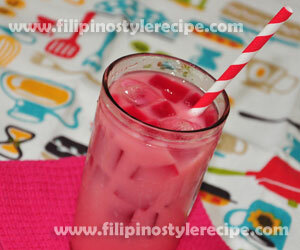 This beverage is made of strawberries, milk, yogurt or ice cream and cubed ice. 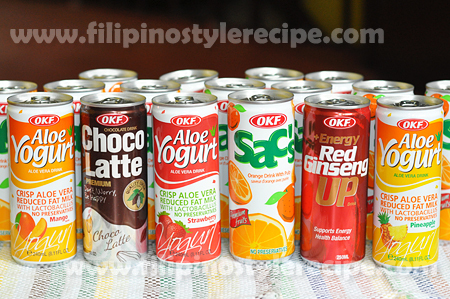 This refreshing beverage is similar to other healthy shakes that are best to serve during summer season. 1. In a blender, process strawberries, milk, and ice cream until blended. 2. Add ice and sugar then blend until smooth, add more sugar if needed. 3. Pour into glasses then garnish with fresh strawberry. Serve cold. 1. You may also use yogurt as alternative to ice cream. 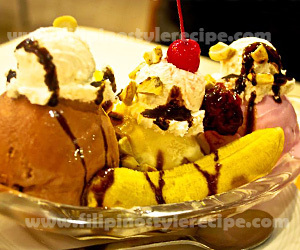 Banana split is an ice cream-based dessert that served in a long dish called boat. 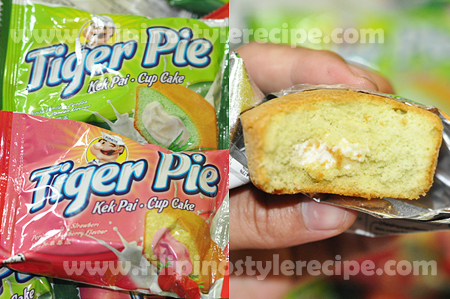 This is one of the best dessert and popular around the world. 1. Place banana slices in a long skinny ice cream bowl. 2. Top with scoops of ice cream(vanilla, chocolate and strawberry). 3. Pour chocolate syrup on vanilla ice cream. 4. 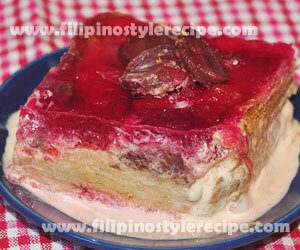 Pour strawberry syrup on strawberry ice cream. 5. Pour marshmallow creme on chocolate ice cream. 6. Top each with whipped cream. 8. Top each with a cherry. 1. Low-Fat Frozen Yogurt may use instead of whipped cream. 2. You may also use strawberry instead of cherry. 3. Caramel syrup is a good alternative for marshmallow creme. 4. Adding waffle stick like stick-O or sliced peaches makes your dessert much special. 3. Some added marshmallow, pineapple tidbits, pecans, choc bits and mini M&Ms bits as toppings.